Tropical storm Bonnie (left) is in the Gulf of Mexico while Hurricane Charley heads toward the Florida Keys. The true-color image, supplied by NASA, shows Tropical Storm Bonnie in the Gulf of Mexico and Hurricane Charley in the Caribbean on Aug. 11 at 2 p.m. ET. At that time, Bonnie had maximum sustained winds of 65 mph (105 kph) while Charley had just reached hurricane strength with maximum sustained winds of 75 mph (120 kph). The storms have varied in intensity since, with Bonnie getting disorganized and Charley gaining strength. The Kennedy Space Center on Florida's East Coast, where space shuttles are launched, is not expected to take the full brunt of Charley. Instead, the storm will likely blow over the area after having come ashore on the Gulf side of the coast and weakened considerably. Tropical storms use warm water as fuel. The water heats the air, which rises around the eye of a hurricane as if going up a chimney. Once robbed of that fuel, air rises less rapidly near the center, and less air is pulled in from the surrounding surface -- which means the winds slacken. Moisture picked up during a storm's long journey across the ocean can continue to dump copious rains inland. When a tropical storm's sustained winds reach 74 mph, it is classified as a hurricane. At 8 a.m. Thursday, Charley had sustained winds of 85 mph. The hurricane will strengthen some prior to landfall, according to the National Hurricane Center. It is forecast to cross the Florida Keys early Friday and then strike the southwest coast of the state. It will then run up the state -- passing over the NASA facility -- and up the East Coast. Bonnie's winds had dropped to 50 mph and no significant change was expected before landfall. The storm is expected to hit the central Panhandle of Florida Thursday afternoon, bringing serious downpours and perhaps isolated tornadoes. Hurricane season in the Atlantic Basin, which includes the Gulf of Mexico and the Caribbean, runs from June 1 to November 30. How Rare is Tropical Storm Double Trouble? TALLAHASSEE, Florida (AP) _ The prospect that a tropical storm and a hurricane could strike Florida on the same day is something meteorologists say they have never seen. "It's almost unheard of," state meteorologist Ben Nelson said. Disaster officials are keeping an eye on Tropical Storm Bonnie as it spins toward the Florida Panhandle, bringing heavy rains that could cause flooding. The other eye is trained on Hurricane Charley, aimed at the Florida Keys at the opposite end of the state. Bonnie was expected to come ashore southwest of Tallahassee Thursday afternoon, with Charley hitting the Keys late Thursday or Friday morning. Charley also could hit the mainland later Friday. 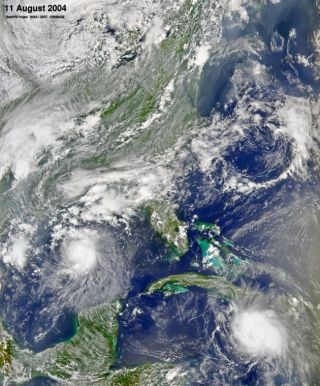 There is a rare phenomenon called the Fujiwara effect, where two storms can essentially collide and spin around each other, but meteorologists said that's not likely to happen with Bonnie and Charley. Florida emergency officials have faced large storms and wildfires in the past, but officials say the storm systems will test their skills, making it difficult to track both. "We've had experience dealing with different disasters running at the same time," said Craig Fugate, the state's emergency management director. "It is more work but it is something that this team's designed to do." The last time two tropical storms struck Florida within days of each other was in 2000, when Gordon hit west-central Florida on Sept. 17 after being downgraded as a hurricane. Days later, Helene slammed the Panhandle. The only time two tropical systems have hit Florida within 12 hours was in 1906, when storms had numbers instead of names. Storm 9 made landfall on the morning of Oct. 17 near Daytona. Twelve hours later Storm 8 hit the southern tip of Florida over the Everglades, AccuWeather meteorologist Ken Reeves said. Officials say that this time around, each county is managing its own response, with help from the state. About 8,000 Florida National Guard members also were available to help with the aftermath, spokesman Lt. Col. Ron Tittle said.